What would a community for security analysts to collaborate look like? Given the sensitive nature of their work, most analysts are reluctant to share what they do publicly, even though they recognize the need to collaborate to solve the problems. 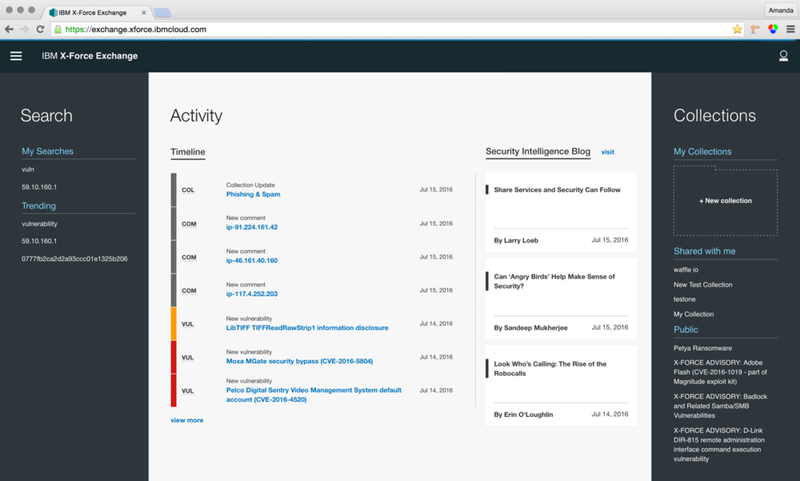 IBM X-Force Exchange is a threat intelligence sharing platform that seeks to overcome these challenges and encourage analysts to share their findings. Analysts are able to search for threat intelligence information, collect their findings, and build a trusted industry contact list to share insights with. A collection is a repository for users to store information found during the course of an investigation. Collections can be used to save X-Force reports, text comments, or any other content. This proposed layout addressed navigation within a collection (switching between notes, reports, attachments, etc) and the need for a central button location for up-voting, downloading, linking, and other actions. Building out a user profile was a major enhancement to the site. It allowed users to gain insight into how trustworthy an individual might be based on personal information and contributions to the site. Privacy settings for personal information allowed users to selectively disclose information. I created a workflow that allows a user to save a report to a Collection they have worked in recently or create a new one from within the same dialog. Based on feedback about the current home page, I developed a new layout that better showcased a variety of content found within X-Force Exchange. This allows unregistered and registered users to see meaningful content when they first arrive to the site. I am currently working with another visual designer to explore different styling treatments that can be user tested.